Heat oven to 350°F. Spray 13x9-inch (3-quart) glass baking dish with cooking spray. Cook rice as directed on package. Meanwhile, in 10-inch skillet, heat oil over medium heat. Cook onion, bell pepper and carrot in oil 10 minutes, stirring occasionally, until tender. 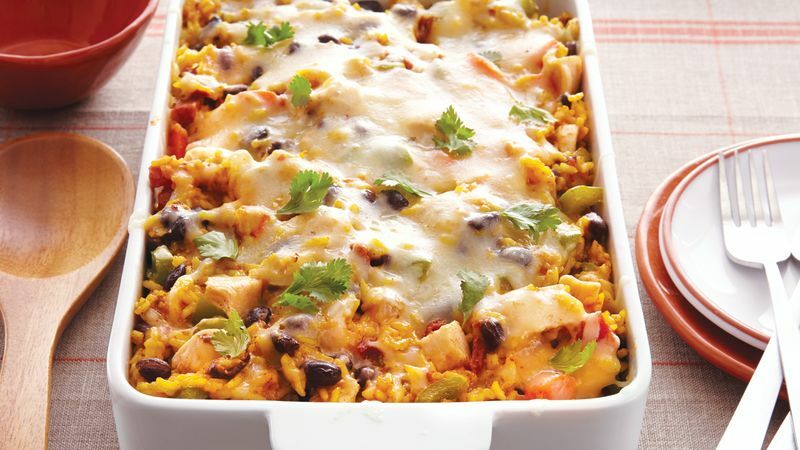 In large bowl, mix hot cooked rice, onion mixture, chicken, beans, tomatoes and 1 1/2 cups of the cheese. Spoon mixture into baking dish; sprinkle with remaining 1/2 cup cheese. Cover; bake 30 minutes. Uncover; bake 10 minutes longer or until mixture is bubbly.